I’ll start by saying that my server stack of choice for most of my career has been WAMP. This is partially due to ease of use, partially due to laziness in finding an alternative. What I did find during this process is that WAMP is a bit difficult to get running Symfony effectively. To be more exact, I (and others) found that XAMPP worked very well with Symfony straight out of the box, so that’s where we’ll start. At the opening prompt, type “php -v”. Your version of PHP should be displayed in the space below. For the remainder of this tutorial, please make sure that XAMPP is on, and you have started Apache and MySQL. Get a hold of the latest standard edition of Symfony2. We are going to use this download two-fold: Once to link to Netbeans so it has Symfony support and code completion. And once again (or more) to use as the base library for our first project. When download is complete, make a copy of the ZIP file and place it somewhere central without unpacking. E.G. C:\symfony2_source. This will serve as our support library in Netbeans. There are many IDE’s out there, and it usually boils down to personal preference (and cost) for most developers. For me, Netbeans is my weapon of choice, and if you haven’t tried it, I suggest you give it a go. Install Netbeans in your directory of choice, the default is usually fine. At the time of writing, Netbeans does not have native support for Symfony2 (although it does support Symfony1.x). So for now, there is a little setup we must do to allow Netbeans to hook into the library and give us code completion goodness. The following setup is done inside the IDE. You should see Tomas Mysik’s Symfony2 plugin appear in the result box on the left. You will see a file text field at the top of the window. Hit the browse button. Hit the “OK” button at the bottom right of the screen. TWIG is one of the more popular templating engines available for Symfony2. After using it already, I can see why it is popular. I’ll get into TWIG later in the series, but for now, we need to setup Netbeans to parse and colour code TWIG files for us to make life easier. Download the latest version of the nbtwig plugin. It should be at the top. These .nbm files are Netbeans plugins. This will install TWIG support for Netbeans. Create your first Symfony2 project! Select “PHP Application” in the “Projects” textarea to the right. In the sources text field, click the “Browse” button. Navigate to your XAMPP installation’s “htdocs” directory and create a new folder called “first_symfony_project”. Hit the “Open” button. 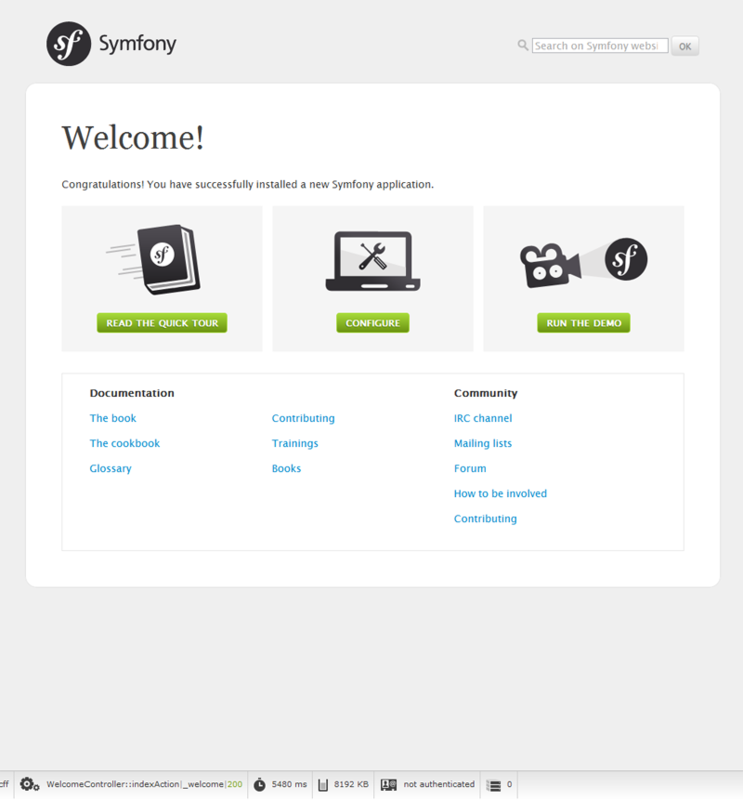 You now have a starting platform for beginning on Symfony. In following posts, I will go deeper into actual development using this monster, so stay tuned. If you have any problems or corrections with the above, let me know in the comments. This entry was posted in Blog, Netbeans, PHP, Symfony, Technical by Aaron Cooper. Bookmark the permalink. I also need some help. 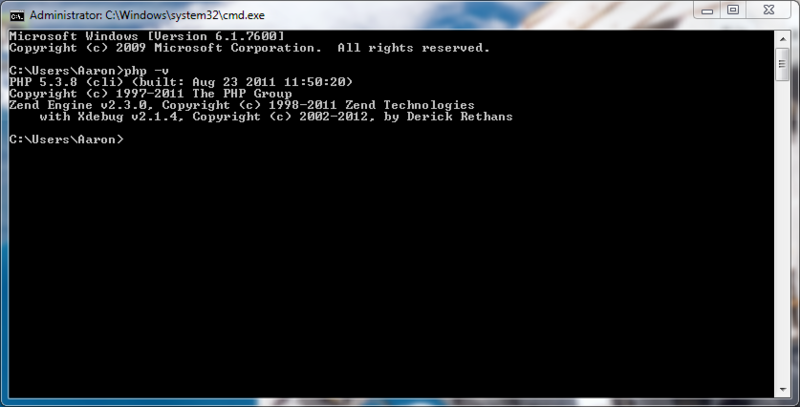 Xampp is simple and I like it. I put my weistbe files in wwwroot on my server 2003 R2 and after many days of errors and problems I finally installed php and phpinfo opens correctly. My last problem is about the contact form that asks for name, email and comment. Everything works as it should according to my browser, thankyou page etc. but I never get an email on my predefined email in php script.How can someone help me here, can﻿ I get someone’s mail address to send my php? Hi Richard. I hope you’ve sorted this problem by now, but I would say the issue here is that you have a misconfigured mail setting in your php and the email is simply being lost locally on Windows Server’s own SMTP server. It could be code related, but it’s just not possible to tell without seeing the code. Obviously replace that email address with your own and run the script in a browser. If you get an email, you probably have a code problem. But I am picking that you won’t get and email, which means your PHP.ini or your Windows SMTP setup is misconfigured. what will I do now…?? That should report anything you are missing or configuration anomalies. And do you have the windows git client installed? It may be that Symfony is trying to autoload a dependency but is not finding a git client to do so. Hi Tushar, I also ran into that problem. To solve it I used the version of Symfony that includes vendors. I had trouble installing using composer, which gave error warnings when downloading the package. Thanks very much Mei. I hope this helps others. Follow this video for much easier installation without using command line..
Hi George. There doesn’t seem to be a link to a video? I’m always interested in seeing other methods of doing things. Thanks mate. Good vid. It only covers some of the post above and all the command line stuff gives you features the vid doesn’t cover at all, but it’s good to have here for others. Hey thanks very much for this. The post is a bit old now and it’s good to have alternatives for everyone to check out. I’ll give Bitnami a try and update this post if I find it circumvents most of the steps. Thanks again, Steven. and when i run config.php,this is what it bring as a major problem. Vendor libraries are missing. Install composer following instructions from http://getcomposer.org/. Then run “php composer.phar install” to install them. How to open the demo projects provided with symphony? For example on the webpage http://symfony.com/doc/current/quick_tour/the_big_picture.html there is “Hello” example. How to open it in the Netbeans and in the browser?